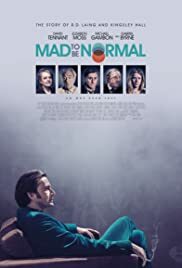 The film is about the period in time when psychiatrist Ronald David Laing managed his home as a refuge for mentally ill patients. A firm believer against coercion, he allowed the people living there to express themselves naturally in a safe environment, while he and an assistant would listen and try to help, in the hope that their minds would heal themselves. His theories were very much against the general medical opinion so he has come to blows not only with the medical community, but with his bigoted neighbors who didn't approve of not normal people living around them. In a way, that state of more or less open conflict with the world is what defines the title of the movie. If normal people behave like that, then you must be mad to want to belong with them. Every actor in this film (and check out the great cast) is acting really well and the mood of the movie, depressing as you might expect, is very well framed. Some people accused it of slow pacing, but if you think about it, you can't do a fast paced movie about mental illness. It is a slow and pain causing condition and the only way to understand it is to go slow. I personally like David Tennant a lot, but I think he was even better cast. He is perfect as the foul mouthed Scottish hipster doctor battling the world for the sake of the patients in his very care. I liked that the movie didn't try to take a side. It very lightly presented Laing's theories then proceeded to show what they meant in practice: with some the results were great, although they didn't lead to healing so much as to less pain, with others the approach was insufficient, while the level of care he afforded his patients made a catastrophic mess of his personal life. The key to the argument is how can a mentally deficient patient decide what's the best course of action for him and how can anyone else prove their treatment is what the patient needed when it alters the very essence of a person's mind? Who would be the more entitled to make a decision? The patient before a treatment or the patient after it? Not to mention society at large, family and doctors, who also feel entitled to pieces of people's lives. Bottom line: not a beautiful film, but one that makes you ask questions. It provides no answers of its own, though.